Feed Me Films, who put on iconic films in great and apt locations, with themed food, are back for February with Scorsese's Casino being screened at The Hippodrome casino in Leicester Square. Screenings take place on Saturday 13th & Saturday 27th February, from 2.30pm - 7pm, and you get the choice of two ticket options - The Mafiaoza for the high rollers at £48, with a 3 course meal and (some) drinks included, and The Hustler at £16, with no frills, (but you can get drinks at the bar). Don't miss it! "Don’t miss this opportunity to see Casino the way God intended, in an actual Casino in an matinee complete with luxury food, drinks and gambling. Watch Scorcese’s masterpiece cabaret-style with a two course 28 day aged steak dinner (salmon & vege available) and live music in the most iconic casino in London. 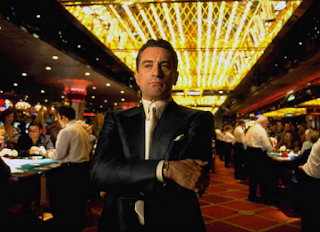 Get dressed up in your finest Mafia garb to the visit The Hippodrome Casino for a screening you won’t forget and complete your Las Vegas experience with a private ‘learn-to-play’ gambling experience after the movie. For those who want to pop bottles, full bar service is available during the movie with seats and group booths available."